I have already heard some fireworks outside although it is only 10:00pm here! I guess they want to go to bed! Well, my quilts are now hanging in a gallery and hopefully some of the First Night Missoula participants will stop in and see them. I do not know yet which of my quilts she has chosen to hang or how many, but I look forward to seeing them on Friday evening at the reception. I always wish I could be a fly on the wall when my quilts are displayed somewhere so I could know what people think of them. I guess I just have to settle for what they will tell me in person or what the gallery owner might pass along to me. Hopefully many of the people I have contacted will stop in and visit the gallery. 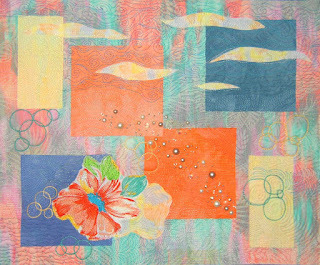 I sent postcards or e-mailed to every I could think of that might be interested in seeing some art quilts. Now it is up to the weather to cooperate and allow some of them to get there! No pictures this post as I am working on a challenge piece for an art quilt show in February and I don't want to share it until it hangs in the show. Sorry! The good thing is a text post loads faster! I've been quilting a piece that is a rather unusual color scheme for me but it seems to be working out pretty well. I used some squares of hand-dyed fabric that we were given for a certain project a few months ago, but I had saved them to use in something else. They went well with a print fabric I had so this is what became of them. I did a lot of free motion quilting and some thread painting, and now I am in the process of putting a spray of embellishment across the piece. All the embellishment is from a pearl necklace I had that broke and I had saved all the pearls, plastic "crystals", and hardware to use someday. You never know when these things will be just the right spark for a quilt. I really like what they are doing for this piece. 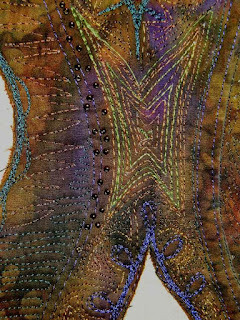 I will have a scattering of more embellishment to the left and above and to the right below the current path of beading. Hopefully the pearls will stay secure on here even though they tend to stick out a bit and will likely get bumped around. I have been starting to think about what to bind it with but haven't completely decided yet. Usually I have to actually fold up pieces of fabric and put them behind the piece on my design board with just a bit sticking out to see what will enhance it as a binding. Sometimes that means something that contrasts or brings out a highlight in the piece and sometimes it means a fabric that will blend with the piece and not create a hard edge. I'm not even sure with this one so I'll have to do some trials. I always enjoy that part of the process as it is just playing around with my fabric stash. I might try numerous different fabrics with it before I decide on the right one. The finishing touch of a binding is important to the entire piece so I always choose carefully. I'm almost done with another piece that is more in my color scheme. It started with a hand-embroidered and beaded square that I wanted to incorporate into something that had a nature feel to it using a color scheme of green, copper and blue. I decided to balance the handwork square with a second square of embroidery and beading and then I chose evergreen trees and a body of water to complete the "scene". I am not sure how I will finish off the water and I am in the process of embellishing the trees by couching mohair yarn onto them. I may add some kind of copper highlighting somewhere but I haven't decided if it might be with paint or bead. I think a copper binding with short stretches of green in it might be a nice finish. I'm getting very excited about my upcoming show at the Whooping Crones Gallery and have been making sure all my sleeves are secure and they are ready to hang. A week from today I'll take them all up to Missoula and see which ones will be hung for the opening on January 2. There will be a "First Friday" opening reception from 5pm to 8pm. I don't know how many people will be out and about that soon after New Year's, but I'm looking forward to being there and seeing my quilts displayed, and maybe talking to people about them. It is so fun to share my work with people and answer questions about the process and the inspirations for them. My six-year old son is on his Christmas break from full-day Kindergarten and I haven't gotten used to having him around so much again. We are already bumping heads a bit, but all in all he's a good, fun kid and we like to do things together. We have had a wonderful Christmas, but he has already had some moments of "boredom" where he just can't figure out what to do with himself (even when surrounded by numerous new toys!). He's loving all the snow we have and he and his dad have built a rather sturdy snow fort in the front yard. I wish you all a very Merry Christmas and truly a Happy New Year! I had an entire day to work on quilts and managed to find umpteen ways not to. I swept the kitchen, did some on-line Christmas shopping, paid bills, organized finances, made some muffins, and now I'm writing this! Sometimes it is difficult for me to get into the creative process especially when I'm not sure what the next step is supposed to be. Right now I am quilting a piece and finding the quilting I'm doing rather boring. I haven't come up with a way to punch it up, so as a result it is just sitting at my sewing machine waiting for me to get back to it. In the meantime I should pick up something else, but procrastination has won out. I did start a new pin-weaving project a couple of days ago that is turning out nicely, and will likely become a focus point of a future piece. 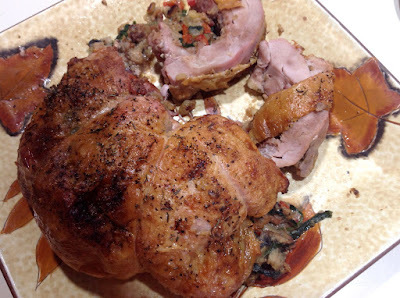 It is multicolor with lots of rusty/brown tones. This time I am making the lines off kilter rather than all straight across as I did the first time. I will probably press this one onto some fusible interfacing to help keep it stable for whatever I decide to incorporate it into. The next pin-weaving I do will probably have either beads or some sort of surface texture like loops or tufts or knots or something. I'm also thinking of sticking to 2 or 3 color families rather than the multi-color thing I am doing now. I'm thinking black, white or cream, and one bright color. I really like the two pieces I did that had that kind of color scheme (one using red, one bright blue). It is very bold and graphic and I think the softness of the woven fibers would be great in a graphic, angular piece. I think incorporating beads into it would be really interesting. I have some really neat black ones… I really enjoy the process of the pinweaving and find it relaxing. 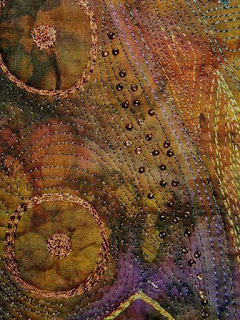 I love the way it develops as you add wonderful fibers and colors. I think it is a technique that will stay in my repertoire. Thank you In Good Company for the inspiration! It is supposed to get very cold here this weekend and I am NOT looking forward to that. It has been relatively dry with very little snow so far this winter and I rather like it that way. I know we need the snow in the mountains so that we have a good water supply next spring, but I'd just as soon it stay up there on the mountains. It looks pretty there and I don't have to drive through it! I really like the changing seasons of Montana, but I definitely prefer spring and fall to winter. We had a beautiful autumn this year and I thoroughly enjoyed it. Now, as evident in my last post, I am already looking forward to spring and the end of winter, even though it has barely begun. Maybe I need to do another winter quilt that reflects the beauty that there is in the snowy whiteness of the Montana landscape and the crisp cold air of January. My piece, "Winter Blues", has been to two juried shows so obviously I have some appreciation for the season and can put it into my work. I've just been sending out some letters and business cards to contacts that I have hopes of convincing to purchase some of my work. I am very enthusiastic about marketing my work, but I am somewhat disappointed in the timing of this recession to coincide with my effort. Hopefully the nesting trend that I've been hearing about will make people want to beautify their "nests" and maybe purchase fiber art to do that. I think it is a very warm and welcoming type of art to have on your wall and I hope that it becomes more accepted as wall art for decorating and enjoying in your home. I finally put a name on the small wholecloth free motion piece I finished and it will be number 3 in my first "series" of work. I am calling it "Spring Thaw III - Seedlings Arise". After sitting for a couple of days while I stared at it and tried to decide what it was to be called, it occurred to me in a very clear way that it was another Spring Thaw piece. I tend to love those muddy colors and making them beautiful with thread and embellishment. What is Spring but a wet muddy mess morphing into blooming color? Oh what a melancholy thought to have in the short cold days of December! I have been watching Chickadees, Downy Woodpeckers, Mourning Doves and various other small birds flitting around my yard and bird feeders this morning. As I am watching them my eye falls on a dark shadow in the long grass--a neighborhood cat skulking and bright-eyed as he/she also watches the activity. True to my usual response to this situation, I get up and quietly open the front door and then burst out yelling and waving my arms to scare the bejeebers out of the cat and send it flying down the path, under the fence and out of sight into the neighbors yard. Luckily I know that the neighbors are at work, but I always return to the house a little bit worried that someone might have spotted my crazed behavior not realizing the purpose of it. Oh well! I don't want to feel guilt about luring birds to my yard with bird feeders and food and then allow wandering felines to pick them off! I risk my reputation as a sane person to protect their welfare. I'll never get the vision out of my head of one time many years ago when we were all sitting on our deck enjoying the day and spotted a hummingbird hovering over the garden. All of a sudden a well-camouflaged cat leapt out of the foliage into the air grabbing the bird and swiftly exited the scene while we all sat with our mouths hanging open. So tragic, yet oddly it makes me smile whenever I remember it. That cat was poetry in motion and has created a vivid a picture in my mind. Not going to happen if I can make a fool of myself spooking the cat before it can grab birds in my yard! Now I've probably created a picture in your mind…! It's not even Christmas and I'm already thinking SPRING! 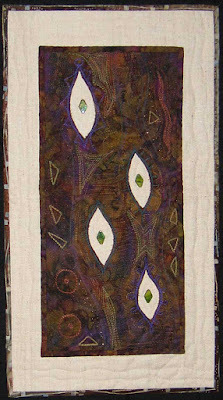 I have been quilting a small wholecloth piece that may or may not be attached to a larger piece when it is finished. I'm doing some thread painting on it and enjoying the process. I seem to have a need to work on small pieces right now since the larger ones just get me all clogged up and bogged down. 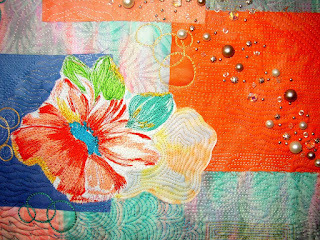 Free motion quilting with just random ideas flowing is so freeing and fun. I change threads quite often and enjoy using shiny rayons and metallics as well as more muted variegated threads which still add great color and highlight. Seeing how they stitch out in the different lines and shapes I decide to quilt is always a fun experience. And it is almost always beautiful in the end and worth the time and effort. There are several art quilt competitions/shows coming up that I have some interest in trying to get one of my pieces into. There is one with a Rock and Roll theme, one that requires the portrayal of something "fresh picked" whether fruit, vegetable or flower, and one that must represent humor in some guise. Of course I have had not had any specific ideas for any of them even though I have been mulling them over for some time now. I have put some fabrics together for a rock and roll inspired piece but they have not told me what to do with them! The 12"x12" piece, Birds of a Feather, that I donated to the SAQA on-line auction has sold and I am very happy about that. Someone in Connecticut purchased it and I really hope they enjoy the piece.